Cooking Grease Waste Cooking Oil Collection Specialist Serving Central and Southern Ontario - Cooking Grease & Waste Cooking Oil Collection for The GTA, Toronto, London, Kitchener, Waterloo, Barrie, Huntsville, Central and Southern Ontario, Canada. 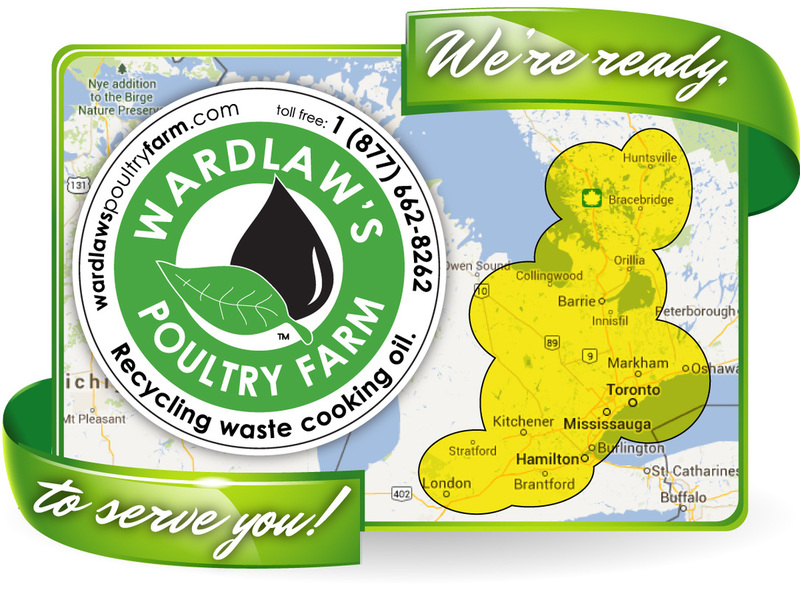 You may have seen some of our containers at your local eateries, we collect and recycle used cooking oil from restaurants, institutions and commercial facilities all over Central and Southern Ontario. We provided grease bins, oil containers, dumpsters and indoor containment tanks in all shapes and sizes. We have the solution you need and are leading our industry in delivering exceptional customer service! Our commitment to exceeding our clients expectations has helped us expand our service area and enabled us to reward our clients with competitive rebate payments. We focus on offering a seamless and integrated system for handling waste cooking oil at your restaurant and that takes one more thing off your plate. When you're not worrying about about your waste management, you can concentrate on what you do best, serving great food to your customers! Dial toll free: 1.877.662.8262 and see how Wardlaw's Poultry Farm could work for you. We serve our valued clients from Toronto and the rest of the Greater Toronto Area, York Region, Markham, Newmarket and into Barrie and Cottage Country as far as Huntsville. We serve clients in Collingwood, Wasaga Beach the rest of the Georgian Triangle. We are also regularly in in Kitchener / Waterloo, Cambridge, Hamilton, Niagara and St. Catherine's delivering excellence in customer service. Are you a bulk collector of cooking oil with your own existing pickup locations? If you are currently in the industry and exploring your opportunities we may be able to partner with you or offer to purchase your product depending on your situation. As a full service solution providers Wardlaw's Poultry Farm is uniquely positioned to execute competitive and timely agreements with honesty and integrity, it all begins with you telling us about yourself.